These wings are fall-off-the-bone tender and amazing. They are extremely easy to make and turn out perfect every single time. They are nice and spicy but if you are more fainthearted, you can leave off the cayenne pepper and go light on the hot pepper sauce. Feel free to change up or adjust the spices and sauce mixture to your liking. These are great for parties or as a meal served with some veggies. Combine all dry rub spices in a large bowl. Reserve 2 tablespoons of the mixture. Add the wings to bowl and mix thoroughly. Cover and refrigerate for at least an hour. Line a baking sheet with parchment paper. Lay all wings flat on the baking sheet and bake for an hour turning halfway through. When the wings are almost done, melt the butter and then add other sauce ingredients. When ready to serve, add the wings to a large serving bowl, pour sauce over the wings and toss. Thank you for sharing this. I will be giving a try this coming week. I may try grilling the wings rather then in the oven. How long do you cook them? One hour, turning halfway through. Enjoy them! Do you cut the wings up into flats and drums or do you leave them whole? You can do either. I usually buy them already cut. I use Coleman Organic Chicken Wings from Costco and they are already separated. What kind of “pepper sauce” do you recommend? Thank you! My favorite it Siete brand. Franks is another good option though. BBQ them whole. Move them up to the higher rack when almost done and use indirect heat to sauce and turn, sauce and turn….. about 15-30 minutes. Gracious! I make chicken wings regularly. To avoid turning the wings over, I line a sheet pan with parchment, but put the wings on an oiled screen. 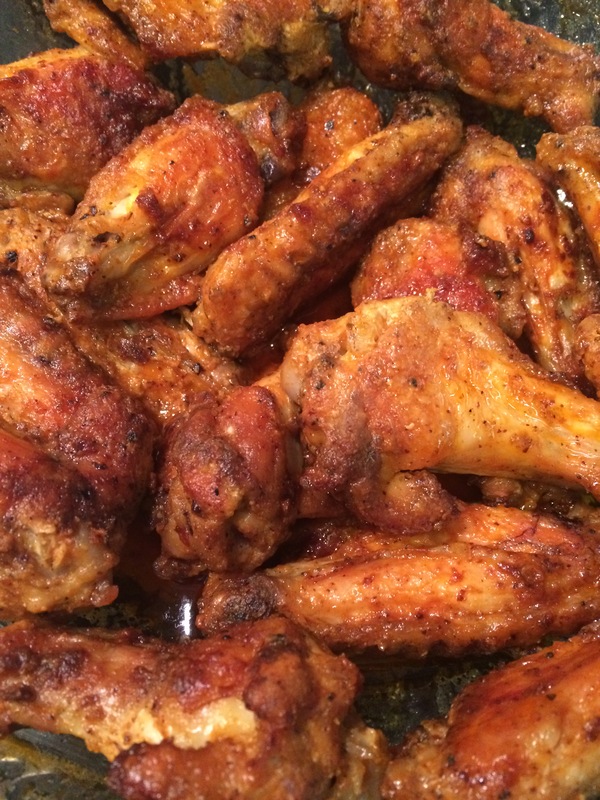 The hot air gets at all sides of the wings and cooks them perfectly. They are also not lying in their own fat and thus are a little healthier. You say check the ingredients in the hot pepper sauce. What do you mean by that? Do you have one you recommend? Q. Is raw salmon OK to eat?